Jerry Moss began playing tennis at the early age of 7, table-tennis that is. Two years later,after winning tournaments at Flamingo Park Tennis Center on Miami Beach, he felt it was only natural to move to tennis. He entered his first tournament at age 10, reaching the finals, and was just under 12 when he won his first national tournament, the Orange Bowl Junior Championship. Jerry progressed through the junior ranks, U.S. 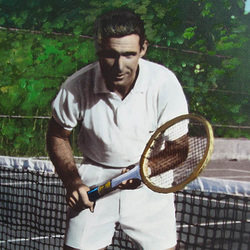 Boys' Singles Champion(15 and Under), U.S. Singles and Doubles Champion(18 and Under), member of the U.S. Davis Cup team, until entering the University of Miami in 1958. As a Hurricane he earned All-American honors two years, was team captain in 1959 and had a career record of 70-1 playing #1 singles and doubles. His biggest win came after leaving UM, when he defeated the worlds #1 ranked player, Rob Laver, in the 1961 Masters Championship.